The La Musa Melete in its former branding, the Grimilkin from, Emilio cigars, is one of my all time favorite blends in the toro and robusto vitolas. Believe it or not, in 35 years of smoking cigars, this is my first lancero and I am pretty excited to give it a try. With its pig tail cap and its seamless wrapper, construction of this La Musa Melete lancero is top of the line. Checking aromas from the foot there were feint fruity notes to the nose and flavors found testing the free cold draw were a mix of toast, fruit and rich tobacco. There was also a nice lingering, nutty aftertaste from the cold draw. As the burn progressed it left behind a soft medium gray ash, but the highlight of this cigar was the complex flavor mix. Nearly each draw had a different mix of flavors. During the 70 minute smoking time I found notes of caramel, nuts, oak, cream, sweet tea, camp fire, wheat straw, brown sugar, toast and coffee in just about any combination you can imagine. The finish was long with a flavorful mix of toast, coffee and sweet cream. Overall my first experience with a lancero was fantastic. The La Musa Melete had superior construction, a great burn time and a fantastic flavor mix that kept me guessing through the entire experience. If you get the chance to smoke one of these, don't pass it up! Most cigar smokers know that with some cigars the best part is the nub. I personally find this true with many maduro wrapped cigars. To avoid burnt fingers I have tried, many times with success, sometimes without, toothpicks, paper clips, tweezers (which doesn't make the wife happy), and many other household items. 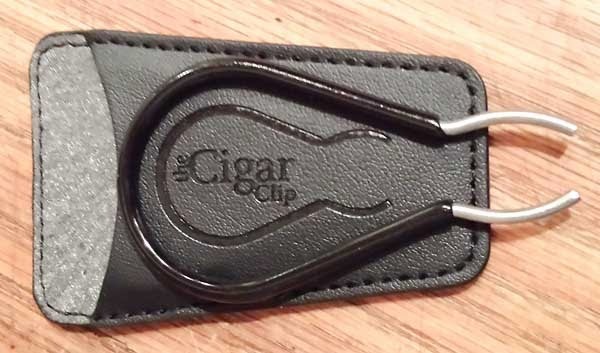 On my last trip to Cigar Train, the owner Brian tossed me one of these "The Cigar Clip", and asked me to give it a try. Well I've done just that and here's the low down. Overall, I think this product works great. 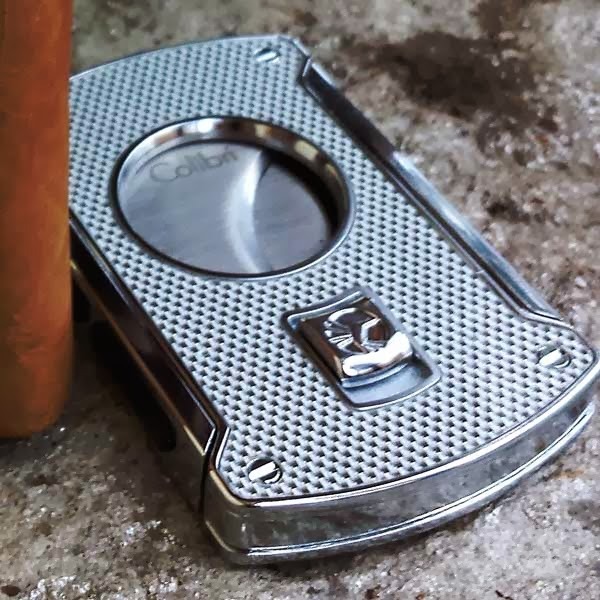 The Cigar Clip is strong enough to hold a fresh cigar, but can be adjusted to hold even the softest cigar nub without damaging the wrapper. If I were still a golfer, I'd be using this clip to hold my cigar out on the course. The only negative aspect that I ran into is that I had to use both hands to spread The Cigar Clip open then place it over the cigar. Perhaps with more use the tension will soften a bit so it can be a one hand operation. There is a instructional video on the CigarPro website that shows the proper methods on making the clip fit larger or smaller ring gauge cigars. For $9.99 I think The Cigar Clip is a pretty good deal and I give it an 8 out of 10 star rating. As I removed this cigar from the cellophane two things jumped right out; how dark the maduro wrapper is and the size of the band. I'm not one for large bands, I will get into that more when I do my post on bands, but it did come right off with no wrapper damage. The Spectre has a stout, toothy wrapper that was rolled on with tight but visible seams and it contained a couple small/medium veins. Feeling down the body, it was packed firmly, but not overly hard full length and I found no soft areas. Checking aromas from the foot stumped me for a bit. After several attempts the best description I can come up with is barnyard. Once the end was clipped the free cold draw also had notes of barnyard, but with a lingering sweetness. Once the cigar was burning, the flavor mix was not at all what I was expecting. The first mouthfuls of chewy, medium bodied, nutty scented smoke had nuances of oak, molasses and nutmeg with the same lingering sweet aftertaste. As the burn progressed the flavor mix changed every two or three draws. I found notes of, nuts, cream, cocoa, coffee, over-ripe citrus, black pepper, peat, hay and a sharp blast of bold red pepper in the final inch. Other than the red pepper in the final inch I thought the ever changing flavor mix was fantastic. Burn wise the cigar was great. It burned cool full length leaving behind a light gray ash that held on for about an inch. Overall, I really liked this Spectre Robusto. The flavor mix kept me guessing throughout the entire burn, most of the flavors came, went and then came back again at one point or another. I'm glad that I picked up a five pack and perhaps a bit more humidor time will give the red pepper time to mellow a bit. Once again A J Fernandez blends another winner in my book! "For this project, we went back to our roots: Nicaraguan tobacco! This is a Nicaraguan puro in the Ezra Zion genre of blending. Since we are doing this for The Lord, it had to be the best work we could possibly do!” added Chris Kelly. The Blessed Leaf Kairos is a 52 x 6.25 box press. The wrapper is Corojo 99 Rosado. The filler includes ligeros from Esteli and Jalapa. Total production is 4000 cigars of 100 boxes and 5 packs. “We chose the name Kairos because of it’s unique meaning to this project. Kairos is defined as a specific moment in time when the Divine intervenes directly into your life. To us, there is a duel application. Obviously, as a person smokes the cigar they will have a “heavenly” smoking experience. Secondly, that the support raised for Christian missions will impact people’s lives with the gospel of Christ.” added Hoover. The Blessed Leaf Kairos will be available for pre-order on BlessedLeaf.com and CigarFederation.com. The official launch herf will be on April 2 on BlessedLeaf.com. 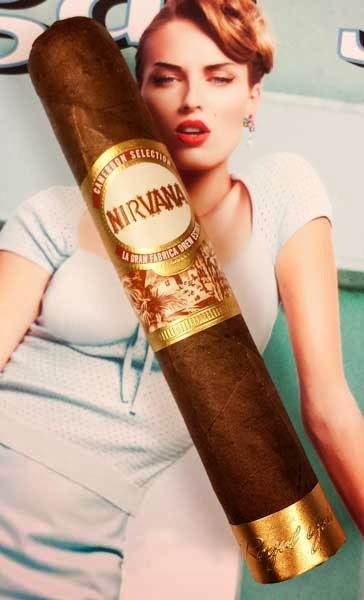 (Miami, FL) March 18, 2014—Can I Have your Attention (CIHYA) Advertising and Branding announces the creation of “Cigar Package Design.” Cigar Package Design is making waves in the cigar industry with their branding and design campaigns. Cigar Package Design is the brainchild of CIHYA’s managing member Humberto Areas. Humberto, born in Nicaragua got his feet wet in the cigar industry when Willy Herrera’s Titan de Bronze needed the company’s identity revamped. Humberto––a longtime cigar smoker with 10+ years in branding and design––was overjoyed to combine his business experience with his passion for cigars. Humberto Areas and business partner Cleveland Cook (who possesses a stellar background as an Art Director) began work overhauling the Toraño Family Cigar Company’s corporate identity in 2010 when Toraño took back sales and distribution from CAO. 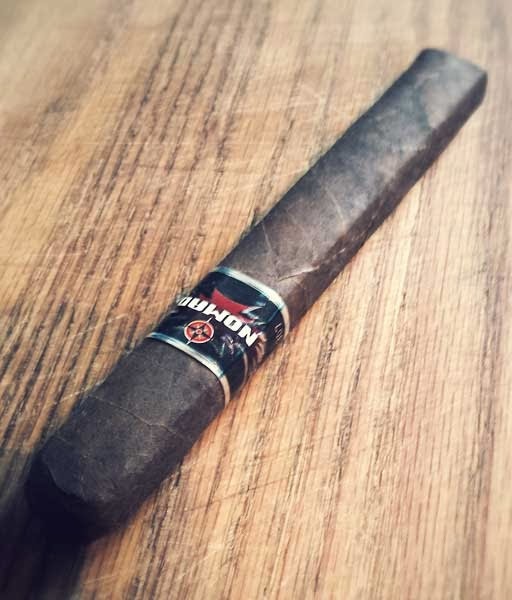 After the new identity was complete, they were soon retained and have created cigar bands, box designs, and promotional pieces for Toraño’s Vault series, Loyal, Salutem, and Exodus Finite. Most recently, the newly created print ad campaign for Toraño’s “Blends from the Vault” series can now be seen in Cigar Aficionado, Cigar Snob and other leading industry publications. The pastime of cigar smoking encompasses comradely, family, and friendship. Cigar Package Design can connect your brand with potential customers through the common language understood by the brotherhood of the leaf. For more information, media and sponsorship inquiries, please contact info@creativasgroup.com, 305.595.7888. This is the first cigar blended by Nish Patel that I have smoked that I am aware of. I picked up this Rocky Patel Xen by Nish Patel at Cigar Train the other day for the drive home but didn't smoke it until the next day. This Xen by Nish Patel had very good overall construction. The smooth Connecticut wrapper was put on with seamless care and there were only the finest of veins present. Cold aromas from the foot were a mixture of sweet tea and toast. Once the cap was clipped with my Colibri V-cutter the smooth, free cold draw tasted like sweet tea. After the cigar was toasted and burning the first draws yielded a flavor mixture of mild bodied oak and sugar. As the burn progressed I could taste brown sugar, cream, coffee and a mild sweet spice that lingered on my palate. The long finish came into play just past the half way point when the flavor mix shifted to a medium bodied mix that tasted a lot like coffee with extra cream and extra sugar. Testing the retro hale I found a mild dose of black pepper. Burn wise this cigar again was pretty good leaving behind a soft light gray ash that held on past the 1/3 point. The body was packed a bit softer than most cigars I smoke, but it wasn't a problem and the cigar never burned hot. I did have one small problem. Right after lighting the cigar, my lips pulled off a dime sized chunk of the thin Connecticut wrapper just below the cap. The binder held fast and the wrapper didn't unwind so all was well. Over all this was a nice mild/medium cigar that would make a nice breakfast/morning coffee cigar. 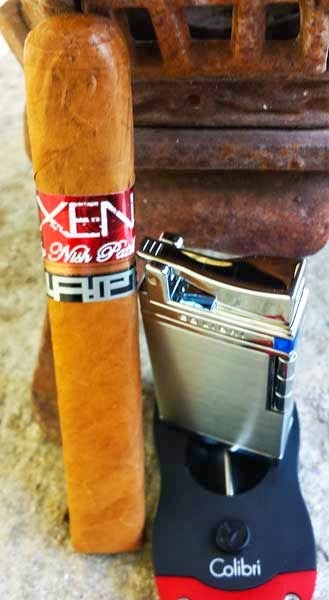 If you are new to cigars, or like them mild, this Xen by Nish Patel would be a great stick for you to try. There were couple things that surprised me with this cigar. When I slid this stick out of the tube I noticed two things right away, first it had no band, second it was a what I would call rustic looking with its rough exterior texture. Neither of these things change the way a cigar smokes, it just struck me a odd. 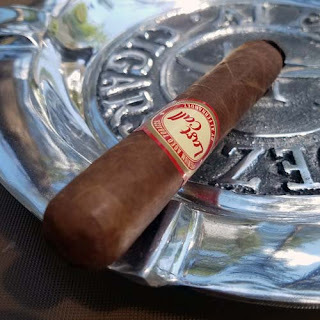 Back in the day, I smoked quite a bit of Partagas product and I'm not sure why I don't any more, but this Black Label was a good stick to get me feet wet with again. Once this Partagas Black Label Maximo was free from the tube I did my normal cold testing. I found notes of spiced tea and perhaps a touch of spiced rum from the foot and once the cap was clipped I found about the same flavors from the free cold draw. Construction wise, the dark, oily, toothy, wrapper made this cigar look not only rugged but stout. The wrapper wasn't seamless, but it was pretty close and there were only few very fine veins present. The burn produced a firm looking white ash that held to the 1/3 mark before falling. Once the foot was toasted and burning I was rewarded with large plumes of smoke and big flavors. Initially the flavors were a mix of cocoa and toast with a barnyard, anise retro hale. As the burn progressed some oak and brown sugar entered the mix and at about the have way point the flavor took on a beefiness, some of that in favor, but more in smoke texture, the smoke just felt beefy and chewy. Soon after that came some coffee and cream followed shorty by creamy chocolate notes for a super long, super tasty finish. The only negative point about this cigar was it developed a wrapper crack soon after it was lit, but I managed to get it stuck back down and finish the cigar with no other problems. Overall, the flavor mix wasn't what I would call complex, but wow it sure was delicious. You Can pick up a 5-pack from Famous Smoke Shop for only $27.99. Give it a try and see what you think! A few years ago Logan from Cigar Federation turned me on to these cigars and I've been smoking them ever since. With the arrival of my new humidor two weeks ago I started rearranging my cigar stock and came to the realization there were nearly a box of these La Herencia Cubana Oscuro Fuerte robusto cigars tucked away in various humidors. Construction wise these cigars are pretty nice. They come packed in a dark thick, toothy, oily Oscuro wrapper with a few small veins and tight but apparent seams. Testing the aromas from the foot, there is a strong woody, chocolate mixture to the nose. Once the head is clipped the free draw contains notes of cocoa and oak. After this medium/full bodied cigar starts burning, the real fun begins. Right from the start this La Herencia Cubana Oscuro Fuerte is in my opinion a chocolate bomb. There are bold notes of chocolate, brown sugar, oak, molasses, cream, charcoal and earth with a nice lingering sweetness on the palate. This is the cigar where I started using the term "burnt mocha" to describe a chocolate, charcoal, cream finish. Now I doubt if I am the first person to ever coin that phrase, but I use it a great deal to describe the finish on maduro wrapped cigars. As this cigar burns it leaves behind a firm light gray ash that normally holds on until about the middle if you are careful. They burn fairly straight, I have never corrected the burn on any, and the wrapper develops a glossy oil sheen in the second half. Overall I feel this is a great cigar. It has good construction, a good burn and great flavors. If you haven't tried this cigar and you like Oscuro wrappers, I think you are missing out. I have been told the blends have been changed and they haven't been changed. All I can say for sure is, that for one reason or another the two cigars were much different. I'm not sure if I will ever know the truth. This is a pretty unique review for me. It's not often I have two versions of one cigar. 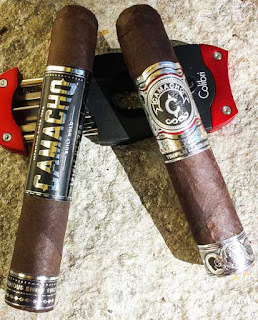 It just happened that a few weeks ago while at Cigar Train I picked up the Camacho Triple Maduro in the old version, then last week the new versions arrived in the store so I picked up the new Camacho Triple Maduro with this review in mind. Old Blend: Construction wise this was a pretty nice cigar. The dual silver bands create a nice contrast with the dark maduro wrapper. The sturdy, toothy wrapper was rolled on with near seamless care there were only a couple of small veins that could be seen. Checking the body, it was packed firm with no excessive hard or soft areas to be found. Checking cold aromas from the foot, there were only faint tobacco notes. I found the same flavor in the free cold draw once the cap was clipped. After toasting the foot the first few draws were a bold mix of red pepper, barnyard and cocoa. This mix faded about ½ inch in and was replaced by a nice mix of cream and chocolate lasting to around the cigar’s mid-point. Once the burn hit half way the flavors changed drastically. The last half was a mix of strong black pepper, dirty chocolate and peppered earth. It was just not my idea of how a triple maduro cigar should taste. The mix was ok if you like pepper, but I was disappointed. The burn of this cigar was the highlight. This 4.5 inch stick burned for 65 minutes and I consider myself a fast smoker. Don’t get me wrong, if you are a pepper fan, which I am not, this would be a great cigar. New Blend: Construction wise this new line triple maduro was first class. The new dual band design gives this cigar a great look. This wrapper with a light amount of tooth was rolled on with seamless care and it was virtually vein free. The body was firmly packed with no hard or soft spots to be found. Since the other reviews of the Camacho new line cigars had went so well I was expecting big things from this cigar. Once the cigar was free from its cellophane prison, I found notes of tobacco and cocoa from the foot. This is more like I thought a triple maduro cigar should be. I clipped the cap and tested the cold draw. The draw was free, but I received a solid full bodied blast of tongue burning red pepper. You can only imagine my surprise and my fear that this new line cigar would be a red pepper bomb. With apprehension I toasted the foot and lit the cigar. To my surprise the first mouthfuls of smoke were a nice mix full bodied mix of earth and cocoa. Some cream followed by some mild brown sugar soon joined in. This was exactly how I thought a triple maduro cigar should taste. As the burn progressed notes of campfire, toast and molasses joined the mix. In the final inch my favorite burnt mocha mix arrived giving this cigar a super finish! This cigar had a bit of a wavy burn line and the ash had a funky spilt the first inch but it all evened out by the mid-point and a nice oily sheen devolved on the wrapper the last half. The burn time on this cigar was again fantastic lasting a full 60 minutes. As I mentioned, this cigar had the flavor mix I was expecting from a triple maduro cigar. I think Camacho really hit the mark on this re-blend. Give it a try and see what you think. It's a great feeling when someone asks you to review their cigars, but you know what? It's an even better feeling when someone asks you to review a great cigar! That's the case with this Veritas Torch Habano Toro. Veritas Cigars asked me to review this stick and boy it turn out to be a real winner in my book. 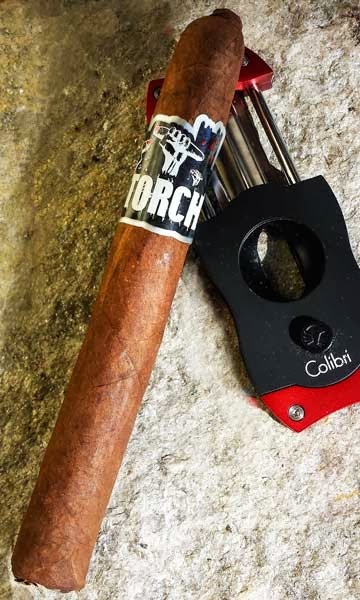 I have been going crazy the last week trying to work this Veritas Torch Habano into my review rotation because I was really excited about giving it a try. Before pulling off the cellophane I had no idea the cigar had a pigtail cap and a closed foot, I like that. Like always the first step for me is to check the foot for aromas. I put the cigar to my nose and inhaled deeply, when the aroma from the foot of this cigar hit my nose I literally said out loud, "wow"! The deep rich aromas of chocolate and tobacco from this cigar were amazing. I clipped the pigtail cap to check the cold draw flavors, of course the draw was super tight, it has a closed foot, but there were still notes of rich tobacco and chocolate. To be honest I had to write Veritas to confirm it was a Habano wrapper because the notes of chocolate were so pronounced I knew it had to be a maduro. Well as you can see, I was wrong. To finish the construction details, the cigar was packed firmly from head to foot, there were only the finest of veins present in the slightly toothy wrapper, plus the wrapper was rolled on with seamless precision. All this care resulted in a really nice looking cigar. The closed foot was easier to light than I had anticipated and the first draws yielded a mix of cocoa, coffee with a slight hint of tree fruit. I didn't find this Torch to have a complex flavor mix but other flavors did come and go as the burn progressed. As the second third started notes of toast, oak and molasses joined the cocoa. In the final third a bit of earth joined in and was followed by some dried fruit. Right around the band area the flavors shifted for the final time to a mix of cream, coffee and cocoa. This wasn't my favorite burnt mocha, there were no notes of charcoal, but it was close and it was very tasty! Burn wise, this Torch toro lasted for 1 hour and 10 minutes. The burn line was spot one and the flaky, light grey ash held for the first third. In the final third the wrapper developed a nice oily sheen for the finish. This Veritas Torch cigar is another great example of careful blending, testing and quality workmanship. I thought this cigar was fantastic and look forward to adding more to my humidors. I would like to thank Veritas Cigars for the opportunity to smoke and review this gem. Thank you! 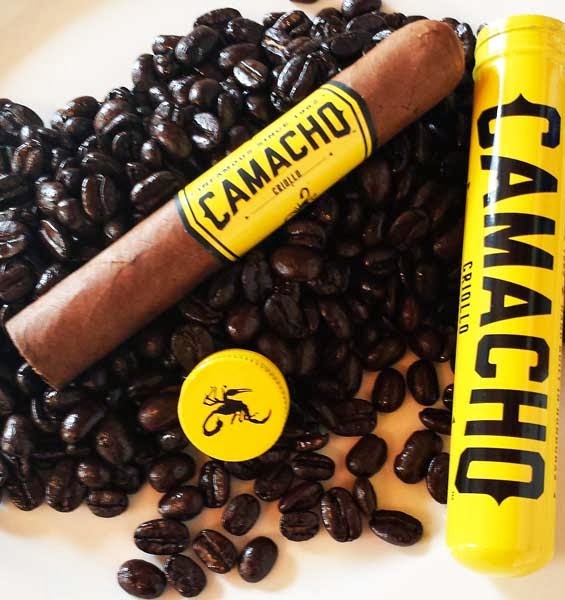 I have been so impressed with these newly banded cigars from Camacho Cigars that over the next week or so I will be reviewing all the blends that are in stock at Cigar Train here in Spokane. Today, it's the Connecticut Robusto. As a side note, I used this cigar and the Criollo in a coffee-cigar pairing experiment for Cravens Coffee using their French roast blend. Cravens Coffee is a medium sized roasting company also located here in Spokane. 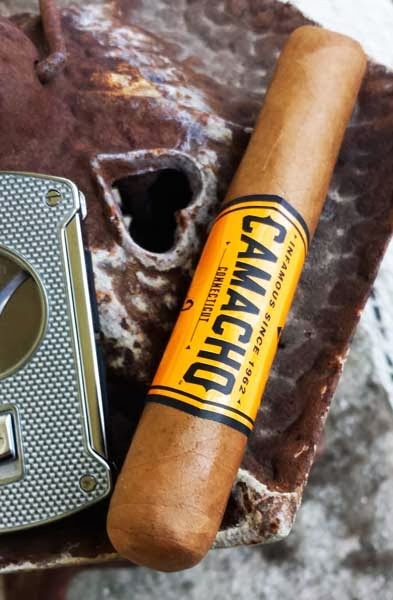 Take a look at the picture of the Connecticut robusto and you will see one of the reasons these Camacho cigars impress me, construction is nothing but top of the line. There are no seams or veins present in the picture and I didn't Photoshop them out. Checking the foot for cold aromas I found notes of toast mixed with a floral or dried tree fruit type of bouquet. Once the cap was clipped, (the cutter I was reviewing at the time tore the wrapper, ugh), the firm but free cold draw contained flavor notes of toast and brown sugar. Once the cigar was burning the first flavors were a mild bodied mix of oak, cream and molasses. After the first few draws I noticed a nice mild spice that lingered on the palate. This is billed buy Camacho as a mild bodied cigars, which it is, but I thought the flavors were bold, but not strong. As the burn progressed there were additional notes of coffee, cream, white pepper, cedar and a hint of anise. This stick didn't have a complex flavor profile, but it was very flavorful. With a quick retro hale I found nuances anise and cedar. Burn wise, this cigar produced large plumes of smoke from both ends and it gave me sixty minutes of smoking pleasure. The burn was a bit wavy the first third, but was razor sharp by the cigar's mid point, where the light gray ash finally gave way. Like I have said in all the Camacho Cigar reviews, if you haven't tried them yet you're really missing out! This is one of the top Connecticut's I've smoked. This silver carbon fiber Colibri slice double guillotine cutter came in a humidor, lighter, cutter and ashtray package from CheapHumidors.com. As time allows I'll review the other products included in the package. Overall this is a pretty nice cutter, it has an attractive overall appearance, it's fairly sharp and the rubber grips on the sides are a nice touch. As I said earlier, it was part of a set, and it matches well with the Colibri Sapphire single jet lighter that was included. On the Colibri website this cutter retails for $85.00 and is on sale for $55.00 at the moment. This makes the $29.99 price tag a real deal. Another plus is the nice gift box that Colibri supplies with the cutter. There was a bit of a learning curve to open this spring loaded cutter one handed due to the way it's designed. After some trial and error I solved the problem by putting my index finger in the closed cutter opening the pulling the button with my thumb. Additionally, I cut fairly shallow on parejos shaped cigars and after cutting several cigars, it's just not sharp enough to do the trick for me, but it does work great on torpedo and perfecto shaped cigars. I give this Colibri slice double guillotine cutter a 7 out of 10 star rating. This Room 101 HN corona is my first Room 101 cigar review. I do have a couple other Room 101 cigars that have been in my humidor the past couple of months that I will review soon. I've heard many good things about Room 101 cigars so I'm excited to give this one a try. Construction of this HN corona is spot on. The Criollo '98 wrapper was put on with seamless care, there are only the finest amount of veins and there's a medium amount of tooth present. Feeling down the body of the cigar, it was packed a touch on the softer side of the scale. Checking the cigar for cold aromas I found a nice mix of spicy cedar and toast. Once the end was clipped the free cold draw had the same flavor notes. Once the cigar was toasted and burning the first draws had a sweet flavor mix of caramel, anise and plum. As the burn progressed there were other notes of earth, toast, peat cream and coffee. Burn wise this HN cigar was very good, it was a slow burner that gave me 40 minutes of smoking pleasure. As the burn progressed it left behind a solid dark gray ash that held on close to the mid point. In my opinion this Room 101 HN corona was just a solid cigar. I enjoyed the flavor mix, the aroma and the smoking time. Now I'm excited to review the other Room 101 cigars in my humidor. After a great deal of trial and error, I am finally at the point where I can give this Cravens French Roast the review it deserves. Simon Thompson, owner of Cravens Coffee, gave me this French roast coffee sample specifically to pair with cigars. Backing up a step or two, this Cravens French roast is a much darker roast than I am used to drinking so it took some trial and error with grinds and coffee ratios to brew my "perfect cup of coffee". All Cigars purchased from Cigar Train in Spokane WA. 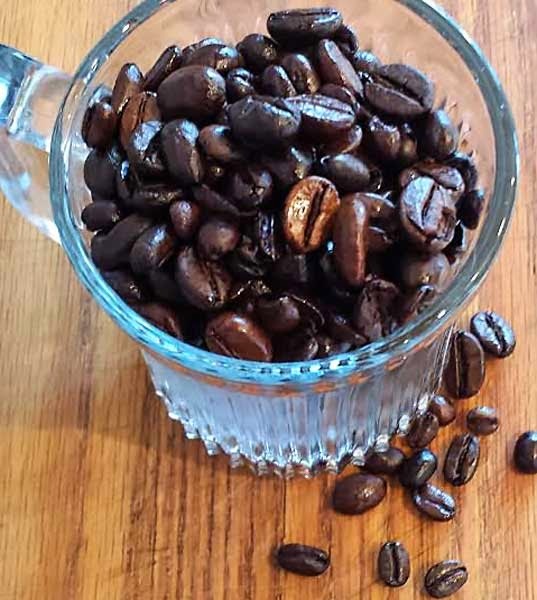 To begin, this is the description of the French Roast from Cravens web site, "Central America’s Ticos – as Costa Ricans are called – send us the hardest, densest, sturdiest beans we source. We give them a taste of France with our darkest roast. 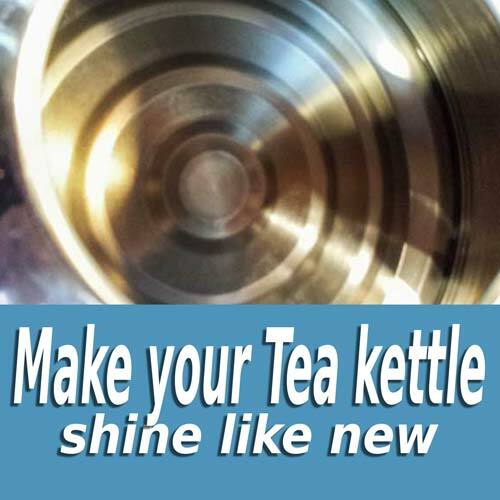 Perfect for those who like hearty flavor and pungent aroma in their cup. Voila!" When you open the bag you see coffee beans saturated with oil and then the aroma of cocoa and rich coffee hits your nose. It's a pleasant experience. After the beans are ground the aroma of cocoa is even more pronounced. I was a bit surprised while pouring hot water over the grounds the aroma changed to more of an earthy, coffee aroma. The first sips were bright and clean with mild sweetness that remains on the palate. I found flavor notes of earth, wood, coffee and a touch of charcoal appeared as the coffee cooled. The coffee left my mouth and palate feeling clean even though the coffee had a chewy, syrupy body that made my mouth water a bit after each sip. Overall it was a great cup of coffee. Now the cup I enjoyed with the 601 Warhead yesterday had a stark contrast to what I found today. As you would expect, everything up to the first sip remained the same both days. The difference comes in the flavors after the coffee is cupped. Yesterday's first sips had bright flavor notes of cocoa and coffee. Then as the coffee cooled it took on more of a beefy flavor profile. It actually reminded me of the Sumatran coffees I am so fond of. Again, it was a syrupy, clean and bold with an underlying sweetness, a great cup of coffee. For my second cigar pairing I chose the Camacho Criollo cigar. This coffee/cigar combination surprised me a bit. 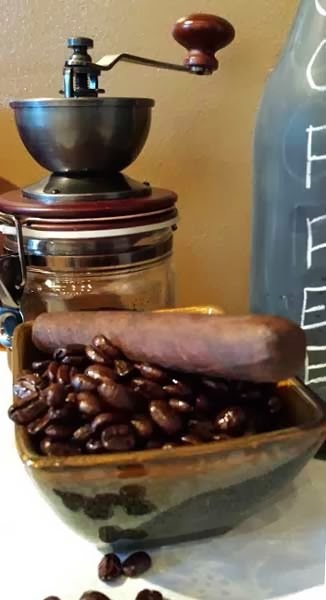 Sipping the coffee did nothing to change the cigar's flavor profile, but the criollo cigar brought out more natural sweetness from the coffee. Over all the coffee still had the same flavor nuances of earth, wood, coffee and a touch of charcoal and the same clean, bold, syrupy body. All the cigars that I smoked for these pairings are like the coffee, they have big, bold flavor profiles. The third pairing was no exception. For this pairing I chose the Camacho Connecticut cigar. I has a bold mix of floral, spicy and creamy flavor nuances. This pairing gave me totally unexpected results. The spice and sweetness of the cigar really brought out some spicy notes in the coffee that I hadn't experienced with the other pairings. additionally the sweetness and the cream in cigar really brought out the natural sweetness in the coffee. This has been a very interesting pairing/review experiment using one type of coffee with three radically different cigars. With each pairing the flavor mix was drastically different or enhanced in the coffee, the cigar or both. This Cravens French Roast coffee earns a 5 out of 5 star rating. On a final note, again I would like to thank Simon at Cravens Coffee for providing this great sample for review. I have to admit that I have a hard time passing up Gurkha's because of their great band art and in doing so I've discovered some pretty good sticks. I guess the first thing to mention about the Gurkha Trident is the lack of credible information about the cigar. 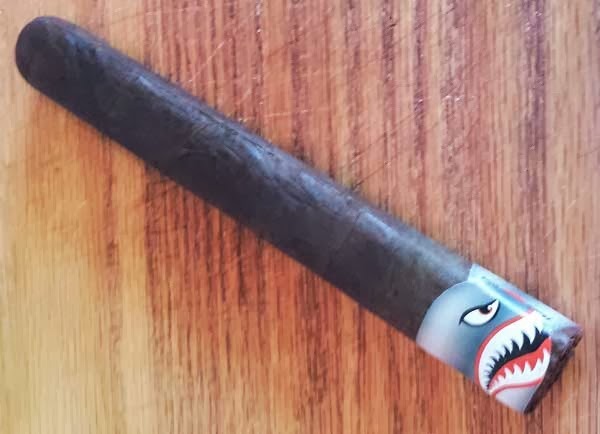 There is nothing about this stick on the Gurkha web site and the big online dealers list the wrapper in one place as Connecticut Broad leaf Maduro, and on the same page as Havana Oscuro. The wrapper itself is pretty dark so I am going with Oscuro on this one. Construction wise, this cigar is sharp. It has a nice band that contrasts well against the dark, oily, seamless Oscuro wrapper. Looking for veins in the wrapper, you have to look close to find any, it's that nice. Testing the foot for cold aromas there are strong notes of semi-sweet chocolate and once the cap was clipped the free cold draw contained the same flavor nuances. The foot toasted with ease and the first few draws were almost straight cocoa. As the razor sharp burn progressed up the cigar's body there were other flavor notes of cocoa, toast, hay, wheat, peat earth and molasses. I wouldn't call this medium/full bodied cigar complex in the flavor mix department, but it was tasty. There were a couple of other points worth mentioning. This cigar produced loads of smoke, more than other any cigar that I have recently encountered. The smoke brought one word to mind, chewy. It felt in my mouth as dense chewy smoke. In fact, one note I made near then end I called this cigar, meaty. I guess that would have to be my overall impression of the Trident, it was meaty and chewy. I hope that makes sense. Overall the flavor mix was not what I expected, nor was the finish. From a cigar with a Oscuro or maduro wrapped cigar I like to them to finish with my favorite burnt mocha flavors and the trident didn't. Don't get me wrong, just because the flavor mix wasn't what I expected, it wasn't a bad cigar. Actually it was pretty darn good and I will be picking up more as time allows. This Nomad S-307 Box-Pressed Toro is another sample provided by House of Emilio and is the first stick produced by the Nomad Cigar Company I have smoked. I am pleased to say it turned out to be a real winner. Read on to see why. Looking at this Nomad S-307 Box-Pressed Toro I see a nice box-pressed cigar with above average construction. The Ecuadorian Sumatran wrapper is oily, it shows only the finest of veins, there is a light amount of tooth and it's put on with near invisible seams. Checking the foot for cold aromas I find notes of tea, black pepper and a slight fruitiness. After clipping off part of the cap, the cold draw is firm, but free, and I can taste rich tobacco, black pepper and dried fruit. The foot toasted rather quickly and I was ready to go. In the first half I found flavors of black pepper, oak, caramel and coffee. Around the mid section of the cigar it began to leave a pleasant after taste of cream and nuts on the back of my palate and a hint of anise on my lips. The final two thirds more flavors entered the mix. I could taste brown sugar, cocoa, nuts, a splash of cream and some charcoal. Just past where the band had been the flavors changed to my favorite mix of burnt mocha. Testing flavors with a retro hale I found a mix of black pepper and brown sugar. Body wise the S-307 started in the medium strength range but finished as a full bodied cigar. It had a slow razor sharp burn line that left behind a firm looking light gray ash. The ash held until the 1/3 mark. One thing that surprised me was how well this cigar held the box-pressed shape for the entire duration. Another item is the smoke, this cigar produced large plumes of smoke. The smoke had a dry finish to it. That's not a positive or a negative for me, it's just something that makes smoking cigars interesting for me. As I said, this is my first Nomad cigar and I think it was a darn good first experiance. I plan on smoking many more! I would like to thank the Nomad Cigar Company and the House of Emilio for providing this sample for review. Thank you! While at Cigar Train the other day I picked up the La Aurora 1495 No.4 to smoke on the drive home. This is the first La Aurora cigar I have reviewed and probably only the second I have ever smoked. Come to find out, as I was reading about this cigar I learned that Jose Blanco originally blended this cigar and I think that's pretty neat. 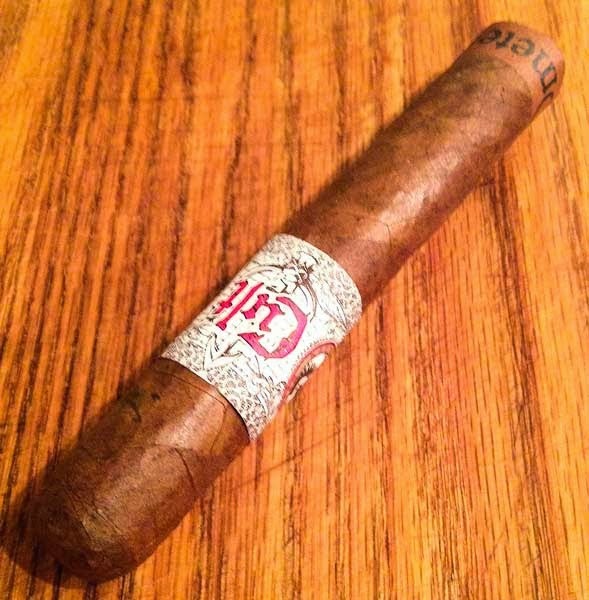 So let's find out just what I thought about the La Aurora 1495 No. 4. Construction of the 1495 is spot on. It has a nice oily Sumatran wrapper that is nearly vein free that was rolled on with near seamless skill. Feeling down the body it is packed firmly with no overly hard or soft spots. To the nose the foot has an aroma mix of tea, fruit and rich tobacco. After clipping the end the free cold draw had flavor notes of fruit and tea. Once the cigar was toasted and burning there were flavors of spicy cedar, raisins and earth. As the slow burn progressed it left behind a firm light gray ash. Near the mid point the medium body earthiness became bolder and some peat joined in. The cigar finished with a nice mix of brown sugar and cream. Overall this was a very tasty cigar and I'm glad that I picked it up. I know these have been around for a while, but if you haven't tried one, I think you should! I've smoked a few sticks from Cult Cigars in the past and really liked them, so on my last trip to Cigar Train I picked up the Cult Ometepe Grande Robusto to see what it was like. Cult is another cigar company that I feel does a better than average job on their band artwork and the Cult Ometepe is another good example with it's double band. The red, white and black band really stands out against the seamless Habano wrapper. The wrapper has a nice oily sheen and contained only one fine vein. Feeling down the body it was well packed, firm, but not hard and there were no soft spots to be found. Checking the foot for cold aromas was a rewarding experience, there were strong floral notes combined with rich tobacco and sweet tea. Once the end was clipped I found the same flavor notes, with an added touch of anise, in the free cold draw. Once the cigar was burning, the flavor mix in this medium body Ometepe wasn't complex, but the first word that came to mind was, delicious! To begin, there were strong notes of dried fruit, sweet tea and tobacco. This mix continued for about the first third then nuances of anise, toast, brown sugar and molasses entered into the mix and lasted well into the final third. In the final third a bit of mild red pepper came and went just to spice things up a bit. Burn wise this cigar was great. The light gray ash held until I removed the band and a nice oil line developed on the wrapper just above the razor sharp burn. I think Cult did a great job blending this cigar and this is my favorite stick of theirs so far. It had great flavors, great burn and was a joy to smoke. Give it a try I think you will be pleased!